One of the first things that you should know about Taiwan is that they are big on night markets. But if you are looking for a list of their night markets, sorry to disappoint this article is not it. I didn’t have enough time to check all of them but I managed to do some food trip because I have to. The day after another I kept telling myself that I’m going to diet another day. A promise that was made to be broken. I skipped the fancy restaurants and ate mostly street food. 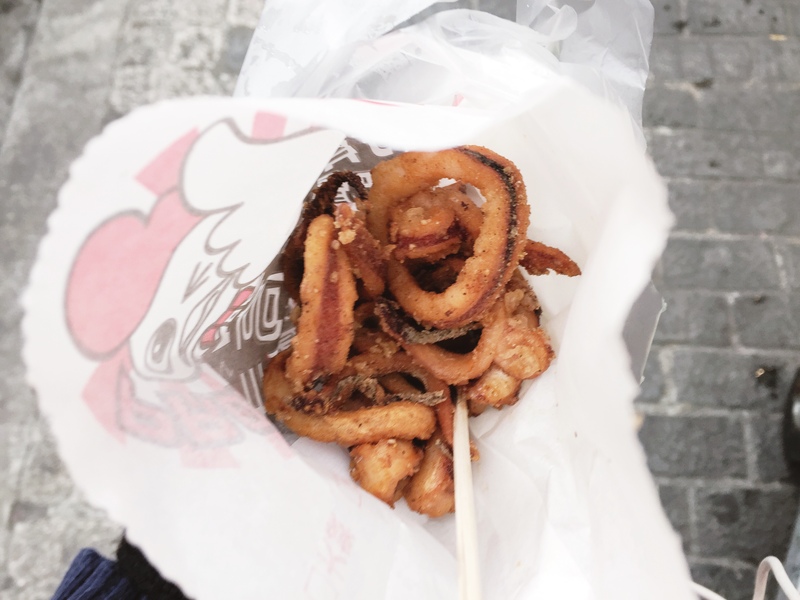 Today let’s do a little roundup of every food that I gobbled in my little time in Taiwan. 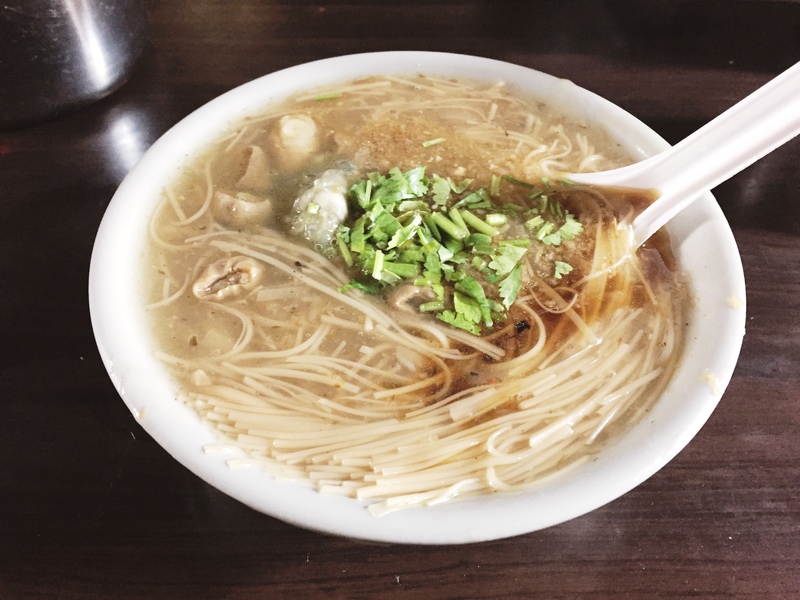 I joined the Tourmeaway Taipei Chill Out tour and by the time we reached Yongkang street I was ready to eat everything in sight. We weren’t given much time to explore and because I knew that they would wait for no one, I didn’t go far and just grabbed whatever I could. The only food that I was able to order is from a food hawker that sells everything fried; fishball, squid ball, chicken balls, and calamari. There is nothing extraordinary with how it looks and I honestly wasn’t expecting much so imagine my reaction when I took one piece and the flavor bursts inside my mouth. It was so good I was sorry I only got a pack. I would go as far as saying that this is the best-fried calamari I have ever had in my life, yes, better than those that I had in more expensive food establishments. The Taiwanese are obsessed with tea so I had to try it, albeit in a form of milk tea. I got chocolate flavored milk tea from 50 Lan. 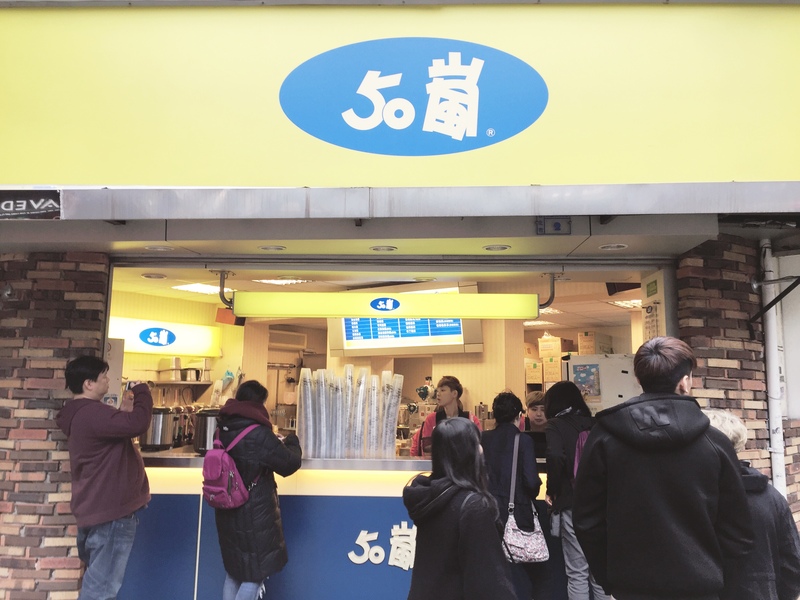 I expected too much because this is, after all, Taiwan where the whole milk tea craze began. I wouldn’t say that it’s bad but there wasn’t anything special about it either. To be honest I had better milk tea back at home. 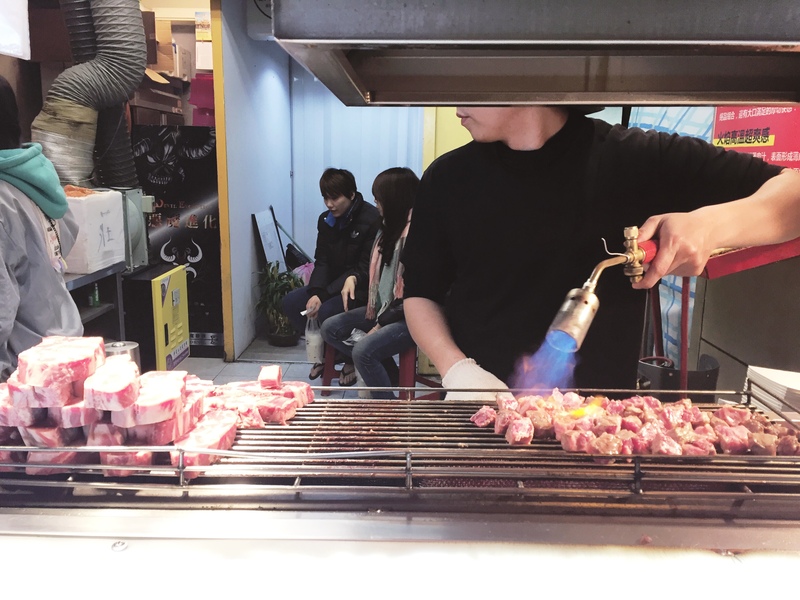 As the name implies, cubes of beef are cooked with a blow torch. 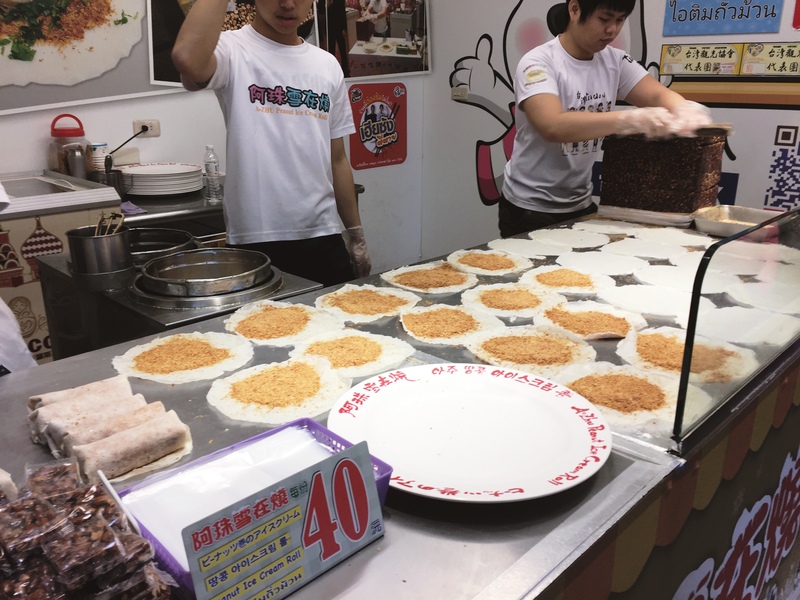 It was fascinating to watch really and it’s one of the best street food you must try when you visit the Shilin Market. The meat is tender, salty and a little bit spicy; just how I like it. How good is it? Like you don’t want to share it kind of good. I tried to find the famous beef noodle but failed so I settled with the only soup that I found on the street, misua soup. I noticed that the misua noodles are not as thin as the ones we have back home. The broth is very thick and creamy, kinda like the consistency of porridge minus the rice. It was nothing spectacular for me but at least it made me forget about my obsession to find beef noodles. 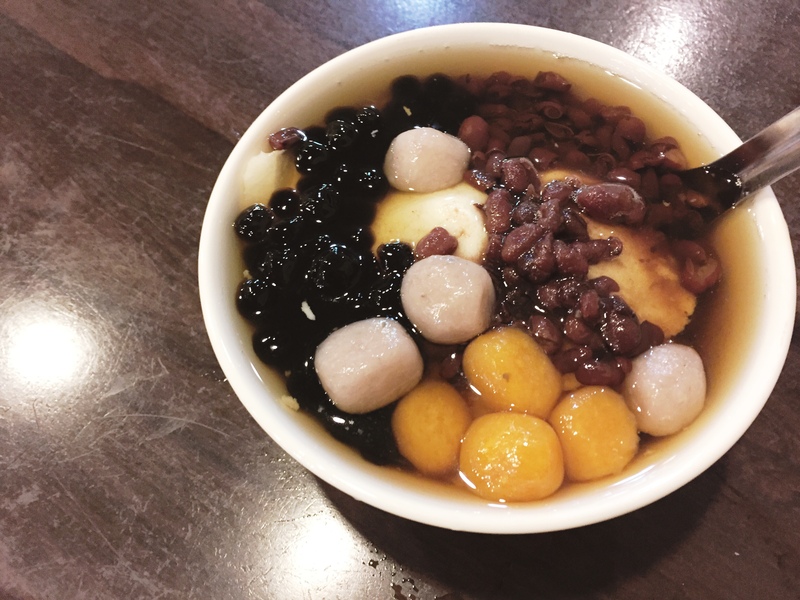 For some reason, I set high expectations for this well-known Taiwanese dessert. I remember having a somewhat similar dessert at the Empress Jade of I’M Hotel and I loved it. So I was ready to love the tofu pudding in Taipei, unfortunately, it didn’t pass to my liking. You’d think it’d be a little sweet at least with all the red beans but nope, it was too bland for a dessert. 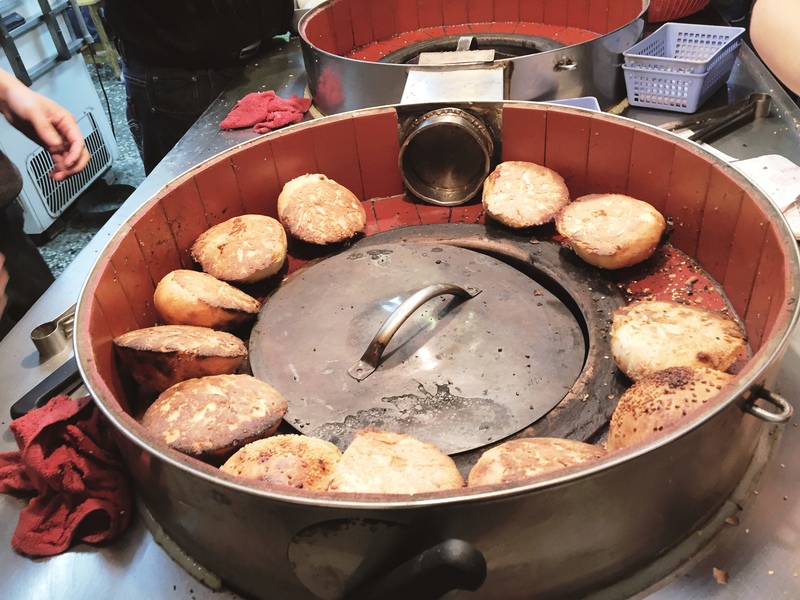 I have always loved pork bun and I didn’t think it could get any better until I tried the baked version in Taipei. It is baked in a special oven that looks like a barrel. It’s stuffed with pork and green onions. The shell was a bit hard and I had to wait for it to cool down a bit before I was able to eat it but it was really delicious. 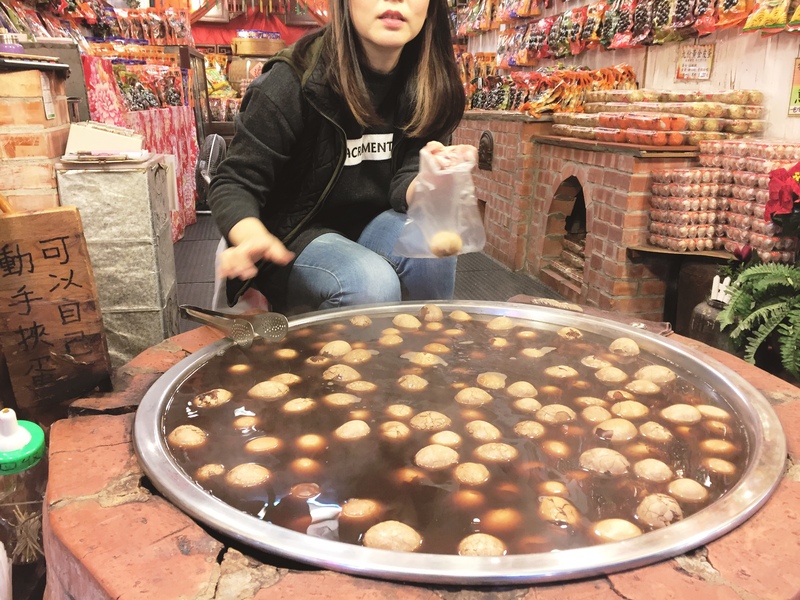 Like we needed more proof that Taiwanese people love tea, here comes the chicken egg boiled in oolong tea. I was amused in spite of myself that I had to try it. I didn’t know at first that it was just a simple boiled egg, I even thought it was balut (but hey I eat balut so if it were, no problem). How did it taste like? Like any ordinary boiled egg really. The flavor of the tea didn’t really do much to influence the taste. 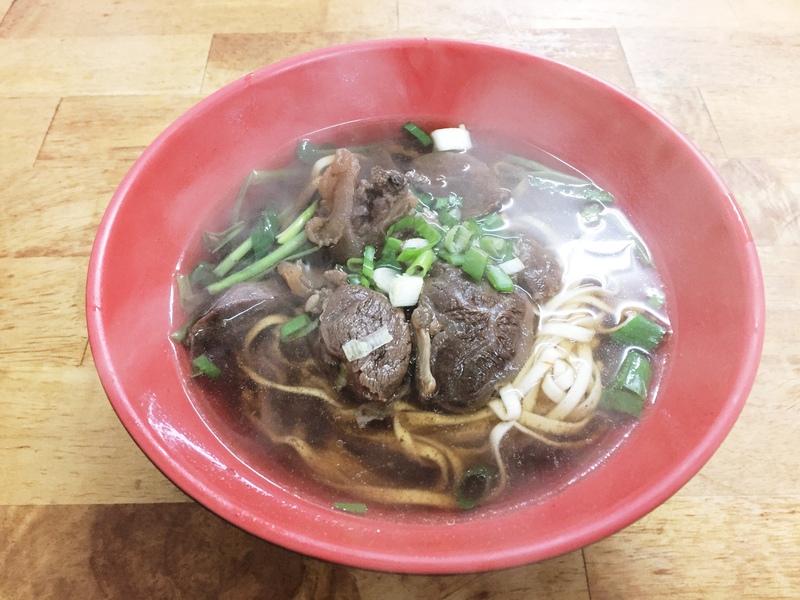 Good news, the beef noodles that I’ve been craving for, I found in Jiufen. Bad news, there was nothing special about it. Sure it warmed me up a little bit, but let’s just say that I had better noodles in the past. After eating this I wondered what the fuss was all about, but then again maybe I just didn’t find the one that serves the most delicious beef noodles in Taiwan. I love red bean and because this cake has it, I just had to order it. I wasn’t disappointed because it was awesome! A friend recommended that I buy this and I was like, “Seriously? A sausage?” But as they say “don’t knock it til you try it!” Good thing I followed his suggestion because after just one bite I have finally understood the meaning of life. Joke! But close hahaha… Kidding aside, it was very good, the texture of the meat is kinda like longganisa, but unlike any that we have back home. It’s kind of sweet, the wrap was a little bit tough, nevertheless, I liked it. 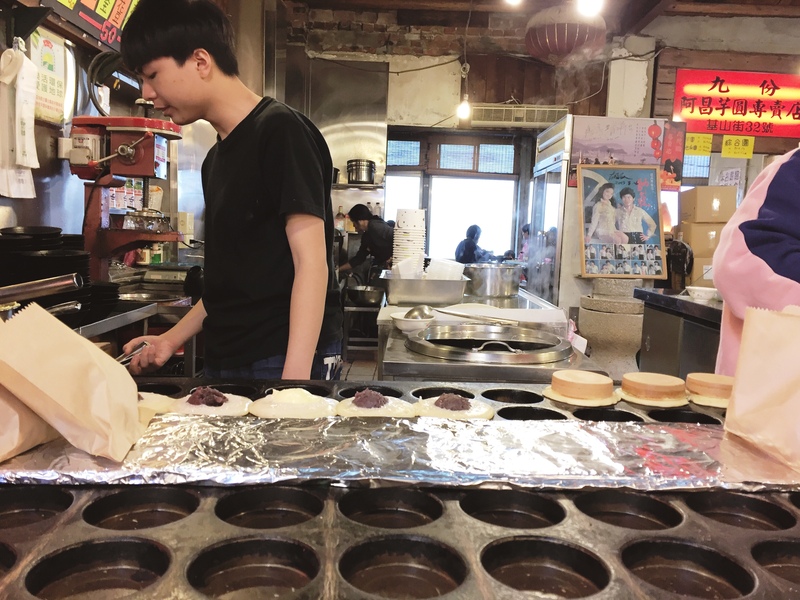 Another friend’s recommendation, peanut ice cream is one fun dessert that you should try in Jiufen. I had a bit of a hard time finding it because I was looking for an ice cream in peanut flavor. I soon realized that this store here is the one that is selling the peanut ice cream. The peanut comes from shaving this big slab of caramelized peanut and then it’s used as filling with at a scoop of ice cream in a crepe wrapper. It was amazing! 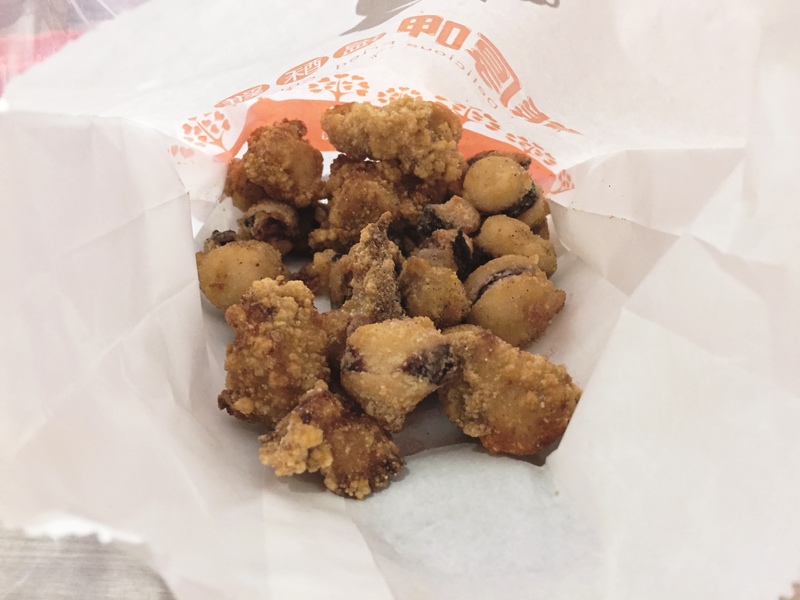 Because I couldn’t get over that delicious fried calamari from Yongkang street, I was happy to see a fast-food chain inside Taoyuan Airport that sells deep fried food. This time aside from calamari, I ordered chicken chops. Though it was okay it was no match for the Yongkang calamari. So there you have it, pretty much everything that I ate in Taiwan that is worth mentioning. What about you, have you been to Taipei? If yes, which food would you recommend? Looking at your photos and reading about them made me want to visit a restaurant that serves Taiwanese cuisine. 🙂 Among the list of food that you shared I’d probably try out that torched beef. It reminds me of the kambing that was cooked during a celebration in our neighborhood. Looks like you enjoyed the ‘diet another day’! 🙂 Certain places are generally famous for street food and if we are there, it is a must try. I would love to try the Peanut Ice Cream. 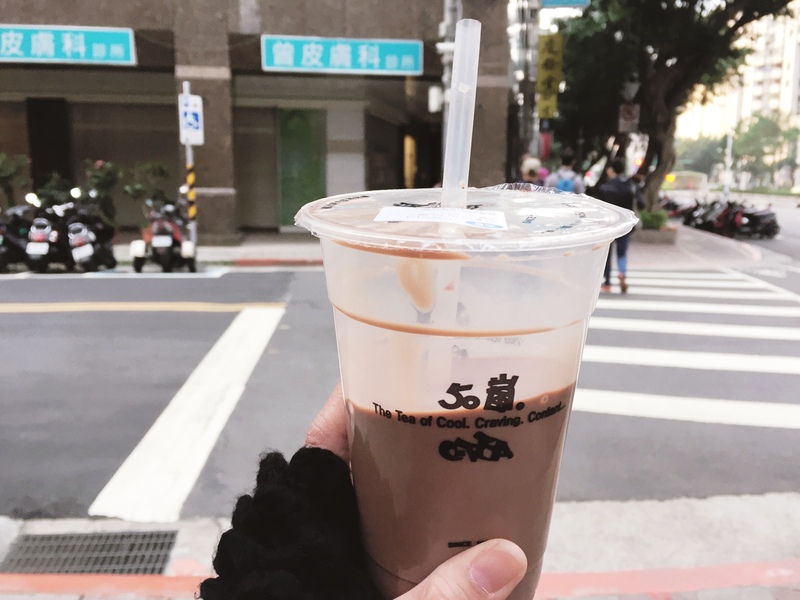 Since you have mentioned it was amazing I think that is one thing we would have tried and also the chocolate milk tea. We do get chocolate flavored tea in Coorg, Ooty in India. Ooh that peanut ice cream is awesome! You have truly given yourself a chance to just rhyme with what your stomach want. 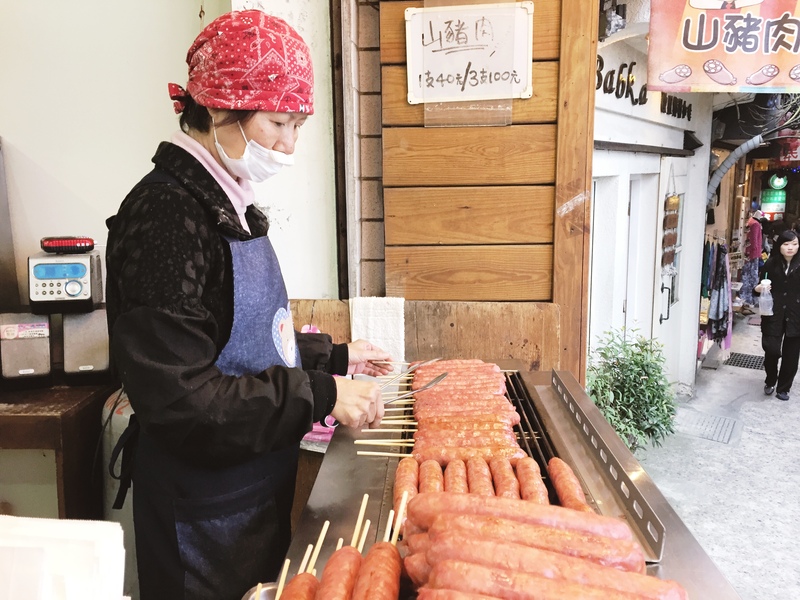 Anyway, if I were with you during this trip, I would also forget about diet, since its always great to taste a local food when we travel, especially in Taiwan. I haven’t been to Taiwan yet, but I’ll surely bear all these street foods in mind for a future reference. Thank you so much for sharing this with us Marge.